You know a trend has reached its pinnacle when Mom starts asking you about something she saw on the home shopping channel. So goes the phenomenon of vinyl records and the record players you find on QVC that will play them. 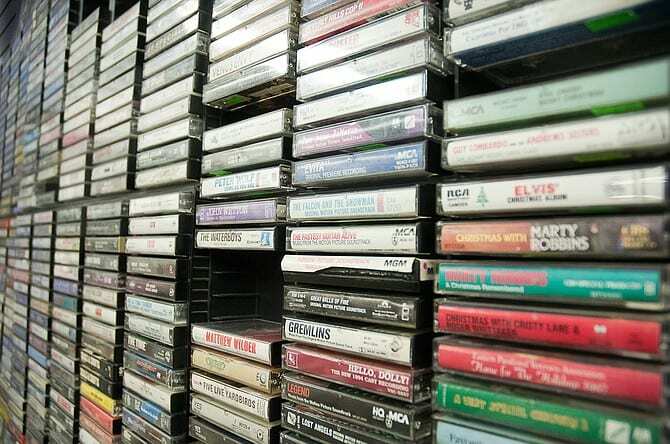 However, following behind this trend is the re-emergence of the tape cassette. It was the portable answer to vinyl, and more compact than the 8-track tape. Even when the compact disc was introduced in the mid-80s, the majority of music consumers were still drawn towards the convenience of the cassette. Boom Boxes and SONY Walkmans helped keep the medium’s relevance well through the 90s before interest waned going into the new century. Record buyers often speak of a truer quality to the sound. But, Finkle said, he finds those who are buying cassettes are kids with older cars that still have tape decks in them. “There really isn’t an audio benefit to them,” said Finkle. Conversations surrounding this by-gone vehicle of mobile music will turn to the “mix tape.” In 2007, Rob Sheffield penned a “Love Is a Mix Tape: Life and Loss, One Song at a Time” with the protagonists going through the remnants of a failed relationship. Sheffield deftly tells the story between the songs of his ex’s mix tape. We made a lot of mix tapes while we were together. Tapes for making out, tapes for dancing, tapes for falling asleep. Tapes for doing the dishes, for walking the dog. I kept them all. Touching on the extent these personal compilations were engrained in our everyday lives, for us old enough to appreciate it. John Cusack’s character in the 2000 film “High Fidelity” goes one step further, speaking of the art of subtlety involved with pairing songs. Indeed, anyone with a blank tape and a tape recorder soon developed his or her own artistic form. “Catch Fire” by 5 Seconds of Summer; “Sounds Good, Feels Good” album released October 26, 2015. Ever since the album came out, Catch Fire has been one of my top favorite songs by 5 Seconds of Summer. It’s upbeat and catchy. Oh say, can you see?/This is not who I’m supposed to be/Without you I’m nobody, killing time. I usually listen to it while I’m studying or doing chores around the house or even just walking home from school. It helps to brighten my mood whenever I start to feel down. The song touches upon the idea of waiting for that moment to come when you can finally break free from your skin and show who you really are. “If I Could Fly” by One Direction: “Made in the A.M.” album released November 13, 2015. If I Could Fly has a mellow feel to it. I would consider myself a hopeless romantic and this song touches upon that. It talks about how you can feel like yourself with that one person and they can’t help you forget everything bad about past relationships because you know they will be there for you all the time. For your eyes only/I show you my heart/For when you’re lonely and forget who you are/I’m missing half of me when we’re apart/Now you know me, for your eyes only. It’s like a fairy tale relationship, one that we all want, one only a few actually get. I end up imagining my fairy tale relationship whenever I listen to this song. “Invisible” by 5 Seconds of Summer: “Sounds Good, Feels Good” album released October 26, 2015. Most of my life, I’ve felt invisible, as if I didn’t have any friends. In my first school when we moved out here, that was true. I had three friends. Moving to my current school has helped me a lot more. But I still feel invisible. I still feel lonely. I still feel like no one is here to help me, even though people are. This is why I can relate to the song Invisible a lot. I was already missing before the night I left/Just me and my shadow and all of my regrets/Who am I?/Who am I when I don’t know myself?/Who am I?/Who am I?/Invisible. That’s one reason why it’s one of my favorites. When the song comes on, I usually just look out the window or close my eyes and focus on the lyrics. “Drown” by Bring Me The Horizon: “That’s The Spirit” released September 11, 2015. Drown is another song that I can relate to. In the past, I’ve had people who I thought were my best friends suddenly turn on me. It broke me. I felt like there was no one there to help me get through that. I didn’t know how to get through it on my own. It left me feeling alone and questioning every friendship I had then and have had since then. Who will fix me now?/Dive in when I’m down?/Save me from myself, don’t let me drown. It’s starting to get better. I’m starting to believe people when they say they are my friend, but I still keep stuff from them. I don’t trust any of them enough to open myself up completely to them. “Dancing With a Wolf” by All Time Low: “Future Hearts” album released April 3, 2015. I look back on the ‘friend’ that decided to turn on me and just laugh now. She still wants to make it known that she hates me. I still don’t know what I did to make her hate me so much, but I laugh every time her or one of her friends tells me that she hates me. I’ve decided to move on with my life and not hold onto something from the past. That’s where the song Dancing With A Wolf comes into play. It’s a kind of aggressive song talking about how you shouldn’t come around here and that I’m not your friend anymore. So don’t you call my name/I will take you down/Should’ve known that you’ve been dancing with a wolf. It basically explains moving on from a heartbreak, something that I have learned to do. I usually ‘dance’ around to this song or sometimes I will air guitar or sing along because it has a good upbeat to it.